BBC iPlayer is one of the most popular online streaming sites in the UK. If you’re abroad then you’ve probably been wondering how you can watch this great British institution. Unfortunately when you’re outside the UK then you’re blocked from watching BBC iPlayer even if you’re in the EU. It doesn’t matter if you’re an expat, on holiday or you just love BBC shows. If you’re not in the UK then BBC iPlayer is blocked. I’m sure you’ve already tried to watch so you know you’re blocked. To unblock BBC iPlayer abroad you’re going to need to get a VPN app such as ExpressVPN which will let you watch in any country. When using the BBC iPlayer app or visiting the website it checks your location. When it sees that you’re not in the UK then it blocks you. The app and website know your physical location because of your internet connection. So if you’re on the beach in Bali, a mountain in Switzerland or quaffing wine in the South of France, old beeb knows. A VPN app allows you to disguise your location. So that mountain you are up suddenly becomes London in the UK. Well, at least as far as BBC iPlayer is concerned. A few years ago back in 2015, BBC iPlayer tried to stop people using this ‘loophole’ and blocked a bunch of different VPN services. Most, but not all VPN services work with BBC iPlayer again and have done for a number of years. It’s important to choose one that does work otherwise you may as well go back to that wine. My recommendation to watch BBC iPlayer abroad is ExpressVPN. I’ve tried and tested them and use them regularly. They’re really easy to use and they’ve got a 30-day money back guarantee so it’s completely risk-free. If you’ve got a bit of time in-between picking sand out your toes then also check out CyberGhost VPN and NordVPN. They’re two other good options for watching BBC iPlayer abroad. To watch on a computer, tablet or phone you first need to sign up for one of the VPN services above. It will cost you a couple of pounds (or dollars). A great way to save some cash is to take the 12-month package which is 49% cheaper. Then download their app. For ExpressVPN this can be found in the ‘Products’ section of their website. Or you can search your regular app store like the Google Play, Apple App or Amazon App store for ‘ExpressVPN’. Open the app and the first time you’ll need to log in with the account details you created. Then press the ‘Choose Location‘ (1) button and then click on ‘United Kingdom‘ (2). You may need to click ‘Connect‘ (3) if it doesn’t automatically connect for you. Watch BBC iPlayer abroad with ExpressVPN. It should only take 15-30 seconds for the app to get connected. Once it’s connected open your BBC iPlayer app or visit the BBC iPlayer website. It’s now unblocked and you’ll be able to watch all your favourite shows from abroad. If you’re still a little unsure then take a look at this quick example video we made. If you want to watch BBC iPlayer on an Amazon Fire TV Stick then you’ll need to sign up to ExpressVPN. They’re one of the only services that work with both iPlayer and the Fire TV Stick. 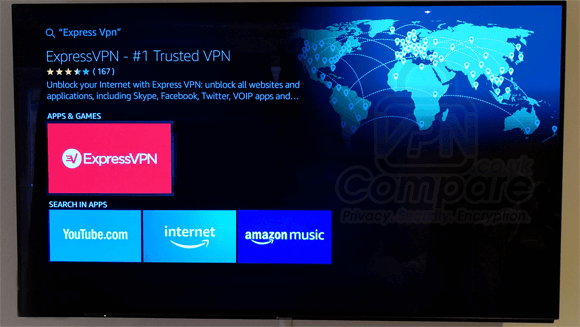 Once you’ve signed up for ExpressVPN download their app directly on your Amazon Fire TV Stick. Then open it and connect to the United Kingdom. You’ll then need to install either Silk Browser or Firefox and visit the BBC iPlayer website directly. It won’t work with the actual BBC iPlayer Fire TV Stick app. 99% of problems watching even when connected to the VPN can be solved by opening your web-browser in Inprivate or Incognito mode. You can find more about how to do that using this link. “This content doesn’t seem to be working” – If you see this message simply change TV programme to watch something else first, once it starts playing you can switch back to your original programme. Generally people want to access things for free, I do myself. However, in the case of watching BBC iPlayer from abroad I always advise people of the old saying, “there is no such thing as a free lunch“. Providing VPN services cost money to the companies who operate them and if they’re not charging you for the service then they’re making money from you in another way. Many free alternatives record what you do on the internet and sell it for marketing purposes to recoup the costs of providing the service. Just look at the recent case of Hotspot Shield and the sketchy free VPN apps sending data to China. Another problem with free services is everyone is trying to pile on them and when too many people pile on the connection becomes slow and unreliable, this leads to buffering, pauses and sometimes just complete hangs of BBC programs. I don’t know about you but buffering really bugs me so I would rather spend a few quid and watch without issues than have it buffer every few minutes. There is also the issue of downloading random “free” tools that more times than not contain viruses, trojans or other nasties that slow down your computer and could potentially be a security risk – it just isn’t worth the hassle. You would think it would be more complicated to watch BBC iPlayer abroad but thankfully it isn’t. Another bonus is once you’ve got a VPN service you can use it for other purposes too like watching ITV, Sky, BT Sport, Channel 4 and more. So for a few pounds, you really do get a lot of bang for your buck (or pound!). Is using a VPN legal? or illegal? I’ve been reading all this stuff about VPN’s with great interest – but I am not techy at all and eventually I get “lost”. Basically, I just want to watch the UK free to air channels BBC1/2/3/4 ITV 1234 C4 C5 etc on my HDTV in Spain. I have Sky+HD but with the new satellite changes the free to air channels have been lost. How do I get my SKY+HD box to directly connect to a VPN (and my Braodband) without having to use an IPad, laptop or Android etc as an intermediary device. Surely I can just plug my SKY+HD box into something ? a VPN router? Then how do I configure it all? Any help welcome..
Hi David, thanks for the questions. Firstly a VPN will only be good for the “On Demand” broadband services such as iPlayer etc. It won’t re-enable the over the air services that you’ve no doubt now lost. So basically those services (or channels so to speak) will be coming over your broadband connection only. Before you consider the current solution you’re attempting I will suggest an alternative. I know you wanted to avoid using an intermediary device but if you do own a tablet or laptop or even desktop that is close enough you can use a basic HDMI cable to output the display to your TV, a standard sized one for a desktop can be as cheap as £4 for 5m (http://tinyurl.com/neywpa3) for a tablet you’re likely to need a small HDMI to large HDMI type (http://tinyurl.com/qyhgxrl) although you would need to double check what type of connection for your device. Although this doesn’t answer your specific question it is a cheaper alternative, you will still need the VPN service on top running on the table/desktop/laptop. For your specific query then you’re likely to need as you say a VPN router. Known as a DD-WRT router, DD-WRT is the software on the router, the brand of the actual router can vary. If you have a specific type of router then it is possible to “upgrade” known as flash the router with DD-WRT software, but if you aren’t a techy as you say then it may be a little bit more than you want to be messing around with. You may want to take a look at the following two pages http://www.vpncompare.co.uk/vypr-dd-wrt – then scroll to the bottom “set up VyprVPN on your DD-WRT router.” will give you a guide on how to set up. Also check http://www.hidemyass.com/vpn/software/routers/ which gives more DD-WRT router suggestions. These are a US based company who will ship worldwide but you are likely to end up paying customs duty etc. Buying one pre-configured is probably the easiest solution but also going to be the most costly. If I can be of any further help or I’ve over complicated things please let me know and I’ll do my best to assist further. Thanks, very helpful, …and a bit more research for me!! But you have certainly moved me in the right direction and helped my understanding. Great, glad I could be of some assistance. If you have anything else you would like to run by us then please feel free to post again. If you would like me to consult with some of the providers (or a provider of your choice) to see if they can offer something pre-configured or something else specific then please say and I’ll be happy to chase it up for you. One other thing I forgot to mention and not sure if it was clear. If you do go down the buying a VPN router… route (no pun intended) then you will still require a monthly or yearly VPN service on top, the router only does the “job” of connection, a service charge for the VPN service is still applicable. So another £3-£7 per month or a cheap yearly service can be as little as £23-£24 on top of the router cost. Streaming video will require a half decent signal, not necessarily a full signal, but if it is too far away/weak you’ll get buffering, jerkiness and poor playback. I’ve been reading this discussion with interest, my mum has a studio apartment in La Cala de Mijas near Malaga, and is at the end of her tether trying to understand how she can view UK channels when she’s over there! So, am I right in thinking that as long as she has a wi-if connection and a tablet, she can access the on-demand channels (BBC, ITV, C4 & C5) on her tablet and then connect the tablet to the TV? Using a HDMI cable? And would this require a VPN monthly subscription and if so, how much per month does it cost? Thanks in advance. I’m just having a look at the providers as we speak! I may come back from time to time with some more questions if you don’t mind, thanks for the reply. No problem, but this will definitely resolve the issue your Mum wishes to fix. what is the difference between proxy server and VPN? A proxy only changes your connection IP for one specific program, eg; internet explorer, it does not encrypt your connection or mask your entire internet connection nor are they fast enough for streaming video. Many times a free “proxy” is run off a home computer or from a connection that isn’t aware the proxy is running on their system. Thanks. I actually pay a monthly fee for the proxy server in order to watch UK TV. Once i sign up to a VPN account do I change the settings on the device I am using e.g andriod media box? Is there a reason why you want to move away from the proxy service you’re currently using? If its working for you and you’re happy with it then there wouldn’t be a need to get a VPN. Most people attempt to use “free” proxy servers, but if you’re paying for the service it should be fine, unless you have a reason for wanting to change? I see. I assume you can run normal android apps on it from the play store? Similar to an android phone/tab. 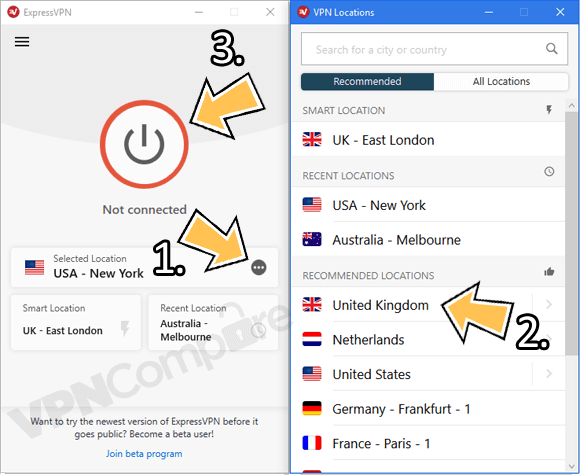 Both VyprVPN and IPVanish have android apps, so it would be basically a case of, sign up to one of the VPN services, download their android app on to your android box, connect to a UK server and then use whatever TV service you require. I can’t say for certain it would work like that because I don’t have experience of the box you’re intending to buy but the theory is correct. I am having great difficulty getting the recently released upgrade of BBC iplayer to recognise that my current VPN has a UK ISP. It keeps telling me that I am not in the UK (which I am not, but the VPN is supposed to hide that) has the new iplayer got some super security enhancement? What device are you using it on Ian? Thanks for the reply. I am using Expat Shield Elite on Windows Vista laptop.I have approached Expat for a solution and await their reply. Probably best to wait for them to reply as they’ll know if it is a problem their end or something your end. I know on tablets for things like BT sport they have started using GPS to determine the location but as you’re on a laptop that shouldn’t be an issue. One thing you can do is connect to your VPN then visit http://geoip.flagfox.net/ and see where it says you’re located. Thanks, no intelligible reply yet from Expat. Apparently I am located in Kent (actually Cyprus) I have noticed something strange; on the new iplayer front screen there is an option to revert to the previous version. I have tried this and it works as it always has, allowing downloads and watching live. To me this means that my VPN is performing normally and implies that there is something wrong with the download. I do not know if the new version is fully released or is still in Demo mode. If one tries the demo version from the banner in the top left corner of the old screen it thinks that I am not in the UK. and will not provide service. Also nothing on the BBC iplayer sites says what the current version number is. The version I have and always get when I reinstall is 1.7.3. Do you know if this is the latest? Sounds very strange. Is it possible you’ve tried accessing the “new” iPlayer without a VPN in the recent past? If you’re using Chrome web browser try using Icognito mode, if using Internet Explorer try using Inprivate mode. Connect to your VPN and then visit the new iPlayer, see if it works. In private mode in IE does not solve the problem. Flagfox ‘confirms’ that I am in the UK, as far as I know I have never tried to access the iplayer except through Expat. I have cleared the cookie files and everything went except index.dat files. I am now a bit stuck, conversation with Expat is ongoing. I suppose that I could remove iplayer, clear cookies then reinstall to see if it makes any difference. Have you had any joy with this Ian? Just a thought, are you able to try it on any other device, computer, laptop, tablet, phone etc? I have not had time to try anything yet, including ideas from Expat, who have said that they are unable to reproduce the fault and are able to watch the new version without difficulty. I noted this problem on my ‘back up’ computer. I am reluctant to try on my main computer, which is connected to our television, until I have exhausted all possibilities as if I lose everything it will probably mean the divorce court!! The latest version of iplayer is 1.7.3, which gives the option to revert to the previous version. We continue to use the old version with no problems. I actually prefer the old iPlayer anyway, can find things easier. As you say sometimes things can be discovered just by pressing buttons and seeing what happens; this morning I started iplayer as normal, selected a programme in the new version and, as usual, got the ‘Only available in UK’ message anyway I decided to just press the download button and lo and behold the download started. I was later able to watch the download. So it seems that the new version will not let me watch ‘live’ but will let me download and watch. Very strange. I shall still try the clean reinstall in a few days time. That is odd, thanks for keeping us updated. Look forward to hearing your results. It appears that sometime during last night (12/13 May) that access to the old version of iplayer was removed and only the new version is available. Fortunately my ‘main’ viewing computer accepted the change without a problem. On my back up computer I have deleted cookies using the tool in IE tools and fid that it does not work very well. I found out how to look into the cookie file and saw many cookies still there, most recent but some going back years. Can you advise whether it is safe to manually delete these including index.dat files? Anyway I deleted iplayer, reinstalled and the original problem remains though I can still download. Oddly the iplayer front screen shows my location as London!! Odd, yes you can delete those files, try again after deleting them and see if it makes a difference. I think “London” is the default, as mine is the same. I guess that is for regional variation programmes more than anything to do with physical location. The iplayer update released on 13 May has introduced the same fault on my main viewing computer, though this maybe a coincidence. Incidently this update has cured another problem that I had thought was something wrong with one of my computers! So maybe there is some light on the horizon. Great news, keep us updated please Ian 🙂 I have noticed iPlayer is awfully slow recent, buffering a lot. Have at last tried the cookie BBC iPlayer and history delete and reinstall without improvement. I have reported this to the BBC. I first found this problem on 19 May. Like you I prefer the old version, find this one confusing, unecessarily complicated, and released with inadaequate testing. Seems to be a triumph of style over substance, looks good but does not work very well!!! The BBC have admitted that there are a significant number of people with the same 2 problems i.e that the viewer is in the UK when, they are not (at least virtyally) and that some programmes are downloadable others are not. So I suppose that we just have to wait for a solution. Good Morning Cate. Problem still exists but BBC have recognised that it is their problem and are investigating. No news yet on when a mod will be released. Thanks for the input. If this is the case there is still the mystery as to why some programmes download and others do not. I aways try the downloads in the same session. If that works then we know Expat Shield is the problem, if not then back to the drawing board. I am beset with computer probs at the moment, my Hotmail account has gone awol! Anyway I finally got round to trying VyprVPN. Almost lost the will to live in setting up the account but finally got going. Mixed results so far. Yes it did let me into programmes previously denied but in the one case that I tried it failed in 4 attempts to download completely. I do not think that this was due to some glitch in my broadband connection as othere devices did not stop working, may have been the BBC but will see how I get on today and report back. What happens at the end of the 3 day trial? Is there a warning or do they just process the fee? I would imagine they just process the fee but I will ask them on your behalf. Best cancel it early if it isn’t suitable just to be sure. I will get back to you asap though. I heard back from VyprVPN, they do not warn you before charging you, so if it isn’t suitable make sure you cancel it before then. Thanks for the info. I have to say that I find that slightly underhand but no matter the first month is not expensive anyway so I shall let it run for at least a month. Got on a bit better yesterday but there seems to be an alarming tendency to let the connection to the BBC drop out so the downloads need watching or a lot of time could be lost. Of course this may be a BBC problem but it never used to happen with Expat. Any comments/suggestions welcome. Could it be anything to do with the settings in the ‘Option’ menu. I do not understand what ‘Protocols’ are. At the moment the default setting is PPTP. Vypr is one of the better providers, in fact they have their own infrastructure which 9 times out of 10 makes them more reliable. Try OpenVPN 160 bit. Are you using wifi or have an unreliable internet connection? I’ve used them with servers as far away as australia to watch things from there without a problem. If changing to OpenVPN doesn’t help jump on their live help as you shouldn’t be getting drop outs. The protocol are all greyed out at the moment so I cannot change anything. I assume thtat this is because I am still in ‘free’ mode so will try again later. Did you pick the lowest priced package? The “basic”? if so only PPTP will be available. It shouldn’t matter regardless, it should work fine, only unless you have an unstable internet connection normally? Yes. I did pick basic, mainly to see if it did what it said on the tin. I never had this problem with Expat so I think it is pretty safe to assume that is not the BBC’s problem either. I have not complained yet, just give it a couple of days to let the connection log file grow. The VPN does not seem to go off, it just drops the BBC website. That may tell them something. I have had no known trouble with my Wi-Fi broadband. I try to do my downloads before 8am when I get a speed in excess of 10 Mb/sec, after 8 am it drops (by design) to 3 Mb/sec. I would definitely contact them directly as this doesn’t sound right at all and they may be able to resolve it for you. Hi Kate, When you say it isn’t working, do you get some kind of error message? Take a look at the video in the article as it shows you what to press if you’re struggling. Make sure you connect as per the video. From your message post it appears you’re connected to the New York server of VyprVPN, disconnect and change to the United Kingdom server. Hi Zahida, It’s possible to sign up for a minimum of one month. All three providers listed in the article offer one month accounts, all three will be suitable for watching iPlayer in France. If you are stuck at a particular point please let me know where and what site and I’ll help you through. Chris, should I join a service like VyprVPN before I travel abroad or when I get abroad? Hi Chris – For security reasons you should join just before you leave. Otherwise you’re going to end up entering payment details over public wi-fi which should be avoided. It also gives you the chance to test the system as an example, you can test from home just to make sure you understand it and you’re all set up for when abroad. You don’t have to sign up weeks in advance or anything, just the day before or day you leave if you have time. Any time, if you get stuck let me know. Would love to hear how it worked out for you and how you found it in the end if you have time 🙂 Enjoy your trip! What storage plan should I go for in order to watch an evenings worth of TV? Hi Guapito, I don’t really understand the question, there are no storage limits involved. Are you looking at a particular provider? I used Tunnelbear as a trial to see how it worked and it gave a small amount of memory which when I viewed a show on Netflix US it ate away at this amount, leaving me with the option to pay for for more. Maybe I don’t get it. I’m not the most tech minded person! Tunnelbear have data limits which as you found out get used quickly for TV services, it is better to use one of the providers recommended in this article because they don’t have any data limits, once you have paid your monthly fee you can watch as many TV shows as you wish without worrying about data limits. Hello, I have just started using UK BBC iPlayer using VyprVPN. Can see content on iPad but get error message when trying to view on Apple TV. No problems viewing Oversead BBCiplayer via apple TV – this works fine. But when I switch to UK BBC Iplayer content wont show on TV screen. Is there a setting on the Apple TV that I need to change? Hi Helen, what error message do you get on the Apple TV? hi , i am going to Dubai , Australia and then Thailand over Xmas and was going to take my ipad to watch some shows on ,my sky go account , could i sign up for one month and i presume as long as i have good wifi it will work in all these countries ? Is there any security issues i may come across by using the Vpn or would it be ok , can you just use one ipad on it or can you alternate as my wife will be taking hers as well. Hi Hunty, Yes, as long as the wi-fi is good enough you can watch in all those countries. The VPN makes your connection more secure because it encrypts your connection. Public wi-fi and hotel wi-fi is insecure so I’d suggest using the VPN at all times when travelling so no one can snoop on your connection. You can have 2 concurrent connections with one account meaning you and your wife can use it at the same time on both devices. Hi, I have a couple of questions, firstly can you set up any of your recommended VPNs from outside of the UK? Secondly I am running TunnelBear and have been reasonably happy for a couple of years (with the exception that the VPN cuts out randomly when using it to stream TV on an iPad). However today, when trying to connect, I have received an error message from them stating that “TunnelBear blocked. TunnelBear can’t reach our servers, please contact your internet provider”. This is a strange message as I use the same Wifi for both my Macbook and my iPad but I am able to use the VPN on the iPad without issue, do you have any advise? All the VPN providers can be set up outside the UK. In regard to Tunnelbear I’m not sure unfortunately as I’m not familiar with their service. If they offer some kind of software then it may be the case that you would have to contact them directly as that error message may related to a specific problem that they can guide you through. Sorry I can’t be more specific. Hi, I have managed to set up IPVanish, however I did have to setup Express VPN first as it was the only leading one that I could find that I was able to set up whilst outside the UK. I am in email contact with Tunnelbear and they are attempting to help me sort my problem out, however I am probably going to move away from Tunnelbear and continue with IPVanish. Glad you managed to get things sorted, thanks for the update. How do I make my Wi-Fi router believe it is in the UK? what solution do I need to purchase? To allow all devices to appear as if they’re in the UK you’re going to have to purchase a VPN Router. It’s basically a standard router with VPN capability built in. The types you get with your local ISP won’t have such features so it would mean installing individual VPN software on each device. While this is easy for your laptop and iPad, the PS3 might be more difficult as I’m not sure if it has VPN capability built in. We’ve recently done a VPN router review (http://www.vpncompare.co.uk/asus-rt-n66u-powered-by-sabai-os-vpn-router-review/) although they are quite costly. I’m going to be leaving for a year in Japan soon, and want to access BBC iPlayer, 4OD and Sky online too. Is it possible to get a VPN that I can switch on and off, so I can have it on for watching UK TV catch up, but off for accessing Japanese only sites? I’ll be in my own room with WiFi, so software I will be able to download onto my laptop will be ideal. Thank you! Yes, All VPNs are able to be turned on and off, you just load the software when you want to watch iPlayer, 4OD, Sky etc. I’d recommend using IPVanish as they work with all the streaming services plus Sky. Some don’t work with Sky. Thanks for that – really helpful. It’s an American website, but assuming I can say I want to access as though I’m in the UK, right?! Yes, it’s an American company but you can choose what country you want to appear as if you’re in. So you can select the UK and then access iPlayer. They also have connections in Japan so you’ll be able to protect your internet connection when using Wi-Fi in Japan to make sure no one can intercept your internet use. Hi there, I downloaded and subscribed to IPVanish this week and am now in Japan. I can access everything, but the buffering is driving me crazy! It’s taken me 20 minutes to watch the first 10 minutes of a programme (Masterchef!). Any recommendations on speeding things up as I didn’t have these issues at home when using my laptop. Thanks in advance! Hi Shauna. Did you download the software for Windows or Mac? Either way at the top look for where it says something like OpenVPN and change it to PPTP. This will lower the encryption so should speed the connection slightly. Japan is quite far away so the distance is the issue, although I know of many people in Australia accessing fine. It can be a combination of distance, slow local internet and further slow wi-fi. Try using PPTP, also trying watching standard resolution on iPlayer rather than HD as that will help. Let me know how that goes. I now live in Australia having moved from the UK, and only have a 4G mobile wifi. Which provider would prove most effective and do you think it would use up a lot of my wifi data provided ? Hi Alan. Living so far will cause issues with speed but many expats in Aus make use of VPNs to watch iPlayer etc. I’d recommend IPVanish or VyprVPN. With IPVanish you can get a refund if it is too slow for you or VyprVPN have a 3 day trial which if you cancel before it finishes you don’t get charged so you have time to test it, both should be good enough though. Video uses quite a lot of data so unless you have a huge 4G data package I wouldn’t recommending viewing video over 4G. A standard definition iPlayer stream could be 600mb or more. So if you had a 2GB data allowance that would be over a quarter used on 1 programme. It all depends on what data allowance you have? Connecting to a WiFi connection somehow would be better to watch video. Anything else please feel free to ask. Yes any of the above are fine in South Korea. I’d recommend IPVanish as they have a good speed. You’re quite some distance from the UK so may suffer a little buffering but I don’t think you will. If you do, watching in standard definition should resolve that, but try HD first. I’ve tried at least a couple from your recommended list. While they’re fine for enabling general content (I’m in China) they’re incredibly slow from their UK servers and often content can break up. You need a REALLY fast cable connection first, so that you can get a reasonable speed after the VPN hit. It’s certainly true, distance does play a part in the speed you’ll achieve when you’re at a great distance and you can’t get much further than China. Although it is mainly down to the quality of the internet connection at that distance. A lot of it as you say depends on your internet connection to start with and the route it takes to the UK. We know of people in Australia & Thailand who watch iPlayer etc without issue and it works in reverse watching sport on aussie TV from the UK but if you’re somewhere with a slightly poor internet connection or even a remote area then the speed would be an issue. One thing you can try is using the PPTP protocol for accessing content as it has a lower encryption and will aid the speed although it will be no good for accessing restricted content like social media in China because they can determine these are VPN connections. The final solution for you Will might be to try a DNS provider, this should ensure no speed loss so as long as you have a half decent internet connection you should still be able to watch iPlayer etc without buffering. Try Overplay (https://www.vpncompare.co.uk/overplay-net) their SmartDNS + VPN would give you the DNS solution for content and a VPN to access blocked services. You should be able to get refunds for the services you’ve tested already if it’s within 7 or so days but each provider is different but let us know if you need assistance. Thanks for the full reply! I’m living in France and have a VPN for watching British TV but I am unable to download the BBC iPlayer app on my ipad. Is this because of my French email address, or is there another reason. I can watch the BBC programmes from the site but need to download the app to be able to download the programmes for watching when I don’t have an internet connection. Hi Jonnne. Do you get a specific error message. I know for the Android store if you registered the device to a specific address in a certain country then you get limited to downloading only apps suitable for that location. Have you tried downloading the app while connected to a UK VPN server? Unfortunately I don’t think there would be a way round that. It would have to be downloaded in the UK. Hi I’m a Brit going to Australia for a year I’m on a 3 mobile network that if I use for more than 60 days in a feel at home country eg Australia will then cut me off. In using a VPN will this also trick my network provider in to thinking I’m in the uk and will then be able to have unlimited data which I can get as an add on on pay as you go ? Unfortunately not. A VPN will only trick websites into thinking you’re in the UK, ie; BBC iPlayer etc. I don’t actually think there is a way to do what you want because that type of thing works off telephone masts. Sorry 🙁 Enjoy Aus though! Unfortunately, since yesterday, the BBC iPlayer is blocking IPVanish’s UK servers. I hope they can get round it soon, but increasingly the BBC is aggressively blocking access from abroad. BBC iplayer has stopped working via Cyberghost vpn over the last couple of days.Anyone know what has happened? It would appear they are blocking users using a VPN from accessing. As a barely VPN-literate IP Vanish subscriber, I was wondering if there’s any way to configure my PC to piggy back on the IP Vanish access to directly access a UK IP address. Or, are there countries’ servers other than those in the UK that I can go through to get to the BBC servers? And how likely is it that IP Vanish (or any VPN) will be able to regain access to the BBC? Please contact us via our contact form via the link at the very top of the site and we may be able to help. Thanks for the offer, but IP Vanish seems to have resolved the issue. Didn’t miss a single week of MOTD!! Great news! As long as your team won.. which mine didn’t, they drew. Some VPN providers have been blocked from accessing. The ones in this article have been tested and are working today. We recommend IPVanish but take a look. Why can I watch on my iplayer on my computer but not on my xbox?. Yes from Spain. Able to watch on the computer but not the xbox, I use to be able too. Hi, pesa i want to know that once someone get one of those VPN provider, at least for one month just to see how it works, if this one person after this one month don’t want to use it anylonger, how can he /she does to quit with it. if you get a only 1 month contract, then after , things will end automatically. You can sign up for a month, if you want to cancel you can do so in the Account area. It won’t automatically stop unless you stop it yourself. But this is very easy to achieve. Have ipvanish, can watch iplayer on my computers but not on my xbox through my secondary router configured with settings from ipvanish. Thanks will have to give them a call..
Isn’t this illegal? You should be paying TV license to watch UK telly, no? You’re only required to have a TV license if you watch BBC channels live. At the moment catch-up TV doesn’t require a license. Hi I live in Egypt and want a VPN for Windows on my PC that will let me access BBC iplayer any recommendations? Hi, yes IPVanish would be most suitable for you. I want to watch TV on a TV, not a computer or device, got a NOW TV box and a UK Now TV account for my TV in the UK. My router in Spain has bespoke settings which I cannot access, so how do I set up a second router, linked to the ISP’s router, to use a VPN to get NOW TV to work ? I’m not entirely sure how the Now TV box works so can’t answer that specifically. Two cheapest choices to watch UK TV on a TV in Spain would be. 1) Sign up for a VPN service on your computer or a laptop and then connect a HDMI cable from the computer/laptop to your TV. Cost being, a few pound for a cheap HDMI cable and the monthly cost of a VPN service. 2) Buy something like the AnonaBox Pro (https://www.vpncompare.co.uk/anonabox-pro-tunneler-review/) that is a small portable router that will allow you to create a new wireless hotspot that is behind a VPN service. The AnonaBox Pro is pretty much locked to the HideMyAss VPN service though which doesn’t work with BBC iPlayer (it will work with the other UK channels). The NOWTV box is effectively a Roku box with some bespoke software/firmware. It is Sky UK’s answer to Amazon Prime. My main objective is that all devices on the network, Mac’s, PC’s and phones will automatically be able to access UK services. When surfing the web and wanting UK sites geo location is frustrating. I also have a GooBang Doo XB-I which works OK in the UK, for live TV, will find out next week if its OK in Spain. The cost of a VPN service is not a problem, but I have tried a Slingbox M1, which had aspect problems, was slow and a complex system using a Chromecast with variable quality. Would like to be able to just press a remote button for EPG and channel selection. I’m aware of the NowTV system, just not how it functions. I’m pretty sure it doesn’t stream content off the internet? correct me if I’m wrong. The solution you need is basically a VPN router. The problem with dedicated VPN routers is the hardware in them isn’t all that powerful so speed will be your main issue. For example I have a 200mbps connection and when using a VPN router I get around 12mbps. This is fine for streaming on one device but if you’ve got 2 or 3 on the go at the same time or you wanted to watch 4k Netflix for example then it wouldn’t be up to the job. That’s a VPN router in the £200 price range. So ideally the cheapest VPN router type option is to get something like the Anonabox Pro or Invizbox Go mentioned earlier. They’ll still only achieve a similar speed but they’re about half the price of a dedicated full-sized VPN router. If you want a faster dedicated router then you’d have to look to something on offer from Sabai Technology (https://www.vpncompare.co.uk/sabai), you’d need a VPN router from them and then their VPN accelerator on top, but it’s an expensive set-up and you’re looking at £400 or more. The last option that might work and is worth considering. Turn a computer or laptop you have into a wi-fi hotspot and run VPN software on that system. You can then connect your wi-fi enabled devices (TVs etc) to that hotspot. I don’t have specifics on the working of that because it’s outside the scope of this site, but a good place to start might be http://www.howtogeek.com/214080/how-to-turn-your-windows-pc-into-a-wi-fi-hotspot/ – This possibly might be the cheapest option. The NowTV does stream, it must have a fair sized buffer, seldom stops. Almost full HD. I do have a BiPAC 7402GXL doing nothing, thought that may be good enough. It was the dog danglies at its time, it can do IGMP Snooping, Virtual LAN. ADSL2, whatever all that means. Of course you got it, “turn a computer or laptop into a wifi hotspot”, thanks for that. should I sign up, would I be able to download TV shows from BBC Iplayer and watch say on a flight where there is no wifi? As I have been able to do when in the UK. I just load up my iPad with lots of shows to watch when on a long flight. As far as I’m aware you can do that already without doing anything special if you’re in the UK. Obviously you have to pre-download what is already available, you wouldn’t be able to watch things that became available after you left. If on the other hand you’re outside the UK already then yes, using a VPN as recommended in the article will allow you to download elsewhere to watch offline. Just connect to the VPN and use the download function on iPlayer. You can certainly watch catch-up TV. In theory you should be able to download too but it’s not something I’ve personally tried. There is no real reason why it shouldn’t work. Have just tried using IPVanish Manchester server and it’s working fine. You should try in Incognito or Inprivate mode on your web browser. I used to watch in the US on my iPad all the time but since they updated(?) the ‘look’ of selecting channels (channel icons to choose from are now in a vertical list in the middle of the opening page under the “TV screen’) what used to be a play button is no longer in the middle of the ‘TV screen’ and I cant ‘play’ any channels anymore. I only get to see BBC1 when I go through Microsoft’s Internet Explorer browser (not Google Chrome). There is no “play button” – it just says “initializing” and BBC1 appears. Any suggestions to get this free service back to working on my iPad? Free sites are notoriously unreliable. If you access on a regular basis then it’s much better to pay the small price for a VPN service that will let you access UK TV services on a consistent basis. Helpppp someone! Anyone?! Watch******v.com directs outside-of-Britain watchers of British TV to purchase PureVPN. When I attempted to purchase this service to be able to see my favorite British TV channels in the States, this VPN site rejects my credit card input attempts. Anyone out there have any suggestions? The site doesn’t look reputable. You can then access all the British TV services directly, such as iPlayer, ITV Player, Sky Go, All 4, Demand 5 etc. Just tested both BBC iPlayer and C4 from Australia using ExpressVPN and working fine as of 16/05/17. You should use “Inprivate” mode on Internet Explorer or “Incognito” mode on Google Chrome if you’re still having issues. I tried connecting with Private Internet Access, one of the best VPN’s available, and I was still blocked by BBC. They must block the entire range of PIA IP addresses. Yes the are blocked, that’s why we don’t recommend them in this article. You should use one of the recommended providers, they’re all tested and working with iPlayer. Bbc i player incompatible in U.K. On iPad since 19/4/17. For downloading? Not sure I fully understand? You can’t use iPlayer in the UK on an iPad? tunnel bear works perfectly from the US but now I still can’t watch iplayer on the BBC website because I don’t have a tv license. Am I right about that or is there a better site to watch things on that’s uk based. You need a TV license to watch legally in the UK. Unfortunately we can’t advise you on the legality about accessing from outside the UK, that would be a decision for yourself.